My experience on tumblr within the Sailor Moon fandom and liveblogging the show has been an interesting one. I realised the cultural influences of the show itself as well as how i saw it through my child-like lens. While there are things i find helpful to understand now that I’m older it’s fascinating what i was probably better off being ignorant to as a child and also i wonder how my perceptions of international and ‘foreign’ cultures was shaped so that i now see this differently. Is it my memory to blame or societal stereotyping? As I loaded up the computer screen to watch Sailor Moon Crystal live, I couldn’t help but compare it to the last time I’d watched Sailor Moon. It was when I was a child and I would sit in front of the TV in the spare room with my brother as he would yap on about how he wanted Pokemon on already. Other than the difference of the device I was using there are many differences to what I remember. I remember loving Sailor Moon for their outfits and the cool wand thing and her head piece. There was magic in it and it sparked excitement in me. While I’m blogging I find myself drawn to the old vs the new comparisons. My memory can be a bit fuzzy but I find myself remembering certain characters and storylines. The thing I remember most is the feeling it gives me, this inner excitement that comes back to me like I’m 7 again. My main finding and the thing that keeps going through my head is I never thought it was in a different language despite the captioning and the language difference. It’s weird that something like a cultural difference never occurred to me as a child and I wonder if that’s something that is engrained in us as we get older. I wonder, do societal expectations and stereotypes as well as ‘othering’ affect our perceptions of foreign content? One of my favourite findings is a multifandom crossover and i like that this happens, this appropriation of the culture and the show with other fandoms. 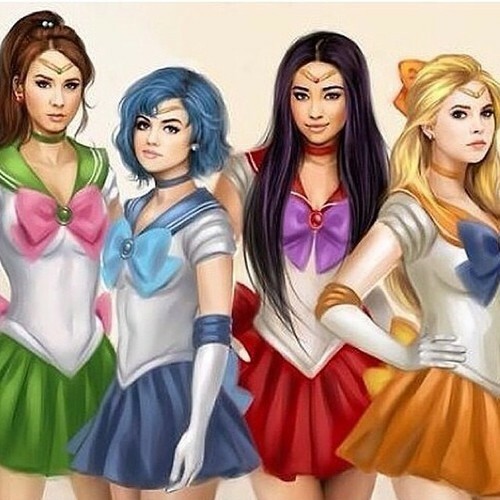 My original tumblr is Pretty Little Liars and someone put them in Sailor Moon costumes. I have never been so excited to see a childhood show and a recent show that i love crossover. The experience of liveblogging and seeing what other people have to say, i feel that some of it i was a bit foreign to, the anime lingo and things of that nature. I did find comfort in the posts that were about what people remember from the old version. I think being integrated into the fandom is hard when you aren’t as invested in the culture as others are but nonetheless it’s an eye opening experience as it exposes you to a different world and with people you would otherwise not interact with. I am now invested in watching Sailor Moon Crystal and a part of me will always hold a special place for the original show as it’s a part of a time when we were innocent and free and not clouded by stereotypes and expectations. I like thinking back to when things were simpler and maybe that’s why these shows are so dear to many people, no matter their origin, they were a part of a time when everything was fun and playful. So i feel like with my posts I’ve been running around like a lost puppy so i decided to get back to the grassroots and think more about autoethnography. Hoppes quotes Batchelor (1997) who describes my confusion pretty well. Hoppes (2014) also gives a couple of varying definitions of autoethnography. Hayano (1979) coined the term “autoethnography” to describe ethno- graphic research done on one’s “own people” through an insider’s perspective (p. 99). Reed-Danahay (1997) broadened the definition of autoethnog- raphy to include “autobiographical writing that has ethnographic interest” (p. 2). Autoethnography has been called a “postmodern form of ethnography” (Neville-Jan, 2003, p. 89) and “an autobiographical genre of writing and research that displays multiple layers of consciousness, connecting the personal to the cultural” (Ellis & Bochner, 2000, p.739). So insider perspective, multiple layers of consciousness and connecting personal to the culture are the parts that stood out for me. During my digital artefact creation i have come to realise there is a whole side of tumblr and fandom that i have been completely ignorant about. I almost feel ashamed that i have stayed away from this side of the internet because I’m used to the familiar and the comfortable. I intend to use this evaluation to my advantage and while questioning certain aspects of technology and fandoms and childhood and culture, to also allow myself to not know the answer to everything. Hoppes, S 2014, Autoethnography: Inquiry into identity, New Directions from Higher Education, Wiley Subscription Services,V2014, I166, pp63-71. A name. A name. A name. What name can i choose for my digital artefact (my tumblr blog)? As someone who is already well established with followers and friends in a another fandom on tumblr I’ve seemed to have forgotten how one starts off. Tumblr itself is a weird mix of fandoms/fangirls, hipsters, anime, gamers etc. It’s like everyone fits into a category. Which is only something i just realised upon reflection of my own personal time on the site. There’s weird rivalries between fandoms and “hipsters” and i hate using that term because i hate to stereotype and the connotations that go with it on tumblr are usually not good. People are usually self-deprecating, sarcastic and funny, at least on the popular text posts. And while the site started out as the place where misfits go to geek out, it still has a certain popularity ranking to it. However, the people that I personally have met through the site are kind people with similar interests. So it’s a wonderful way to make friends, f you know where to look. It’s funny how one enters into a community and can immediately connect with them. However, you also need to know where to look. Do i choose a name related to the old Sailor Moon? Or the new Sailor Moon Crystal? Should i try to make it an inside joke from the show? Hmm i don’t know enough to be able to do that. I start by simply typing in Sailor Moon to the tag page in tumblr. Sailormoonscreeencaps, oshiokiyo and foreversailormoon are the first blogs to appear. I am unsure what oshiokiyo refers to as well as one of the tags usagi tsukino and for some reason my initial reaction is to think what have i gotten myself into. Apparently “Oshioki” means punishment or scolding, and the “yo” is a sentence-ending particle that’s like an exclamation point. Sailor Moon is saying, “I’ll punish you!” Which i find pretty cool. And now i feel like an idiot for not knowing that “Usagi Tsukino is the present-day form of Princess Serenity and the civilian identity of Sailor Moon.” What kind of fan am i? Granted i haven’t been involved with the Sailor Moon fandom since i was young. I’m interested to see how Sailor Moon fans interact with technology as the only fan interaction i had as a child was with my friends when we would talk about it but now technology has changed the fan experience. As i scroll through the pages i smile because it has some of the characters i remember from my childhood and that’s when i figured out my blog name: Sailor Moon is my childhood. After looking through the site i already started thinking about my next posts, analysing my tumblr experience, fandoms, fan interaction, new fandom vs old, the role of technology etc but then i put that aside for a moment. I realised how familiar most of the characters were and even though some of them were in different languages it still felt familiar which is odd as i don’t understand the language. It was just a feeling i got, a flashback from my childhood i guess. I will continue to explore this and my journey into this fandom and the interactions with fellow fans. So last week I had a look at Sailor Moon in the media which eventually transformed into Sailor Moon vs Barbie. However I have found myself unsure of which direction I am taking my project. After consulting Chris I decided to map out the areas of my project that I can possibly explore. I’m making a Sailor Moon tumblr and engaging with the fandom and the new and old series as my project. I would like to explore tumblr, the community it has and the dynamic of the site. I would then like to dig deeper into how Sailor Moon is projected on this site. Another aspect I want to explore is the old series vs the new series. I want to watch the new series and compare it to my memories of watching the old series as a child. Then I would like to explore Sailor Moon in the market. What toys, games, merchandise can you get? As well as the aspect of costumes and dressing up as these characters. I feel then I came make a post about the overall experience of the entire process and how researching this has affected me. Upon my research on how Sailor Moon is portrayed in the media i found that a lot of the articles compared Sailor Moon to Barbie and basically portrayed Sailor Moon as the strong fighter and Barbie as the superficial glamour doll. Smith (1996) “In their search for identity in an ideal, young 1990s teenage girls have outgrown the materialistic Barbie world of coifs, glamorous fashions and pink cars. Sailor Moon is above this superficiality. I believe this, while it portrays Sailor Moon as great, also relates to the portrayal of women in the media. Barbie is seen as superficial and girly, which in turn suggests that being materialistic somehow is bad. The issue that comes up is the women being strong vs weak (Sailor Moon vs Barbie) and suggesting that being girly means you’re weak. However, in reality women can be both of these things. I feel that both of these characters show women in different ways and i find it interesting that the people associate being strong with men and this whole societal stereotyping and sexism that comes with these statements. As i reflect on my initial reaction i realise that these opinions are from at least 10 years and as a woman in this day and age we are more aware of the stereotyping of women. Barry, D 1995, To The Moon, Sailor, Buffalo News, United States. Smith, N 1996, Sailor Moon eclipses Barbie, The Record, Kitchener ONT. So there’s this place where the fangirls hangout, you may have heard of it, it’s called tumblr. In this little nook of the Internet where you can find many lingering communities and fangirls that are considered to be in a small, tiny fandoms which may be considered peripheral groups. I for one have always stuck to a particular fandom but I decided to explore this phenomenon of cosplay. So I began by typing in Asian cosplay, not a good idea unless you were searching for naked people. Finally I found what I believe to be a peripheral group within the cosplay community- manga cosplay as it appears to have much less posts as ‘normal’ cosplay. First I should start by explaining a few things. The actual meaning of peripheral is relating to or situated on the edge or periphery of something. I feel manga and cosplay (as separate entities as well as one entity) are both peripheral parts of the tumblr community as most TV show fandoms take up a solid part of the site. Within the tag I found this wonderful cosplay video, which, had everything from Asian rooted costumes to non-Asian costumes to slightly, influenced Asian costumes. I found this to be an interesting mix of the cosplay scene and to show how this represents the mix of culture within cosplay. This group mostly uses photos to show their costumes but I managed to find videos from the events and what I liked was how happy everyone seemed when they were taking part in this. By viewing these pictures and the videos I am impressed by the amount of effort and detail put into these costumes and the effort it must take to portray this character, even just for a second and how they are able to capture that through the lens. I found myself surprised by my own preconceptions of manga cosplay and the expectation that they would all be Asian. I found this quite interesting to watch and to observe. I liked the world that it took me into and the excitement of the costumes and the characters, even if I don’t know the characters names. The definition of celebrity according to google is a famous person, especially in entertainment or sport or the state of being well known. In terms of my subject Sailor Moon, i decided to explore the brand/character of Sailor Moon is the celebrity and also see if the voice actor is as well. 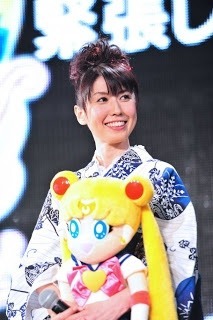 The Japanese voice actor of Sailor Moon, Kotono Mitsuishi (it kept trying to autocorrect her last name to the Japanese car brand Mitsubishi, odd!) has her own website, which i am unable to understand due to it being in Japanese so i chose to google translate some of it. It seems to discuss her current adventures. I google translated it and she is talking about her visit to Australia. Funnily enough i was directed to this page via fan on tumblr where she has a following. The Kotono tag on the blog has both Kotono and Sailor Moon posts. In her tag on tumblr, there is a mix of her personal life, events and sailor moon posts. 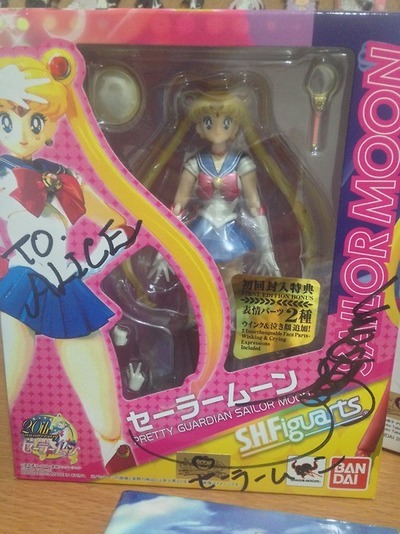 While the pictures are tagged of her they feature her almost always pictured with Sailor Moon and sometimes even without her, maybe just her signature. Sailor Moon has several Facebook pages dedicated to her. The book series has 663,576 followers, the TV Show has 131,564. Kotono Mitsuishi only has 968 followers. Upon reflection i wonder if it matters if the character is more famous than the voice or the actor but if you’re are looking at it to see which could be considered the celebrity, I would say it’s the character. As i just did, we are now able to find out origins of people and things with a click of the button and i wonder if i wouldn’t have been so ignorant if i had been able to use the internet for things like that and perhaps even if i had the internet access we had today, would have i cared? Personally i never knew who the voice actor was or even knew the origin of the character. I was born into the younger series where we all had broadband so we would constantly hear “GET OFF THE INTERNET I NEED TO USE THE PHONE.” And we used to get up early and watch it on CheeseTV. The idea of fame and a collective admiration of people or characters is too broad to delve into completely but i can say that as i got older when i heard the word costume party i thought Sailor Moon. You should be able to spot me from the loud laugh, sparkles, weird outfits or general over-the-topness. My name is Kristy and I’m currently in my fourth year of a double degree of a Bachelor of Journalism and a Bachelor of Communications and Media majoring in International Studies. I recently took a semester off as i was unsure of what job i was getting at the magazine i currently work for, TV Week. I started interning there and after two days i was up for about 3 jobs both full time and part time and now i work there part time. I’ve had a ton published since working there so basically i already have my dream job. Ultimately i would love to live in America and work there. In the future i hope to keep writing and maybe even write a book or five (If i listen to all the things psychics have told my family since i was born apparently it’ll be a hit but we’ll see). I would also love to work possibly in TV or presenting, depending on where the wind takes me. My interests are largely in TV, obviously, and i have an obsession with the show Pretty Little Liars. I have a tumblr with just over 15,000 followers and spend way too much time on there. Other interests include reading (I’m so addicted to The Maze Runner right now) and I also love fashion. I would definitely consider fashion journalism one day but for now I’m more of an entertainment journalist. As for this subject i am unsure of what exactly i want to look into but i think i would really like to look at anything involving TV shows or as Chris suggested even how TV Week translates into Asian culture, like what version of it they have over there. I am definitely open to suggestions. Anyway, that’s pretty much it!